Mystic Seaport currently has more than 50 Dhows, of which 48 are sailed regularly, giving the Museum the distinction of having the largest fleet of Dyer Dhows in North America. The Dhows are used year-round for teaching sailing to the local community, as an integral part of the Joseph Conrad Overnight Sailing Camp, and in the racing series. Each Dyer Dhow is named for the yacht club, family, or individual who generously donated it to Mystic Seaport. It is through these generous donations that the Museum’s sailing programs have continued to teach hundreds of people annually–young and old alike–to capture the wind in their sails and enjoy their time at sea. Do you love to sail Dyer Dhows and are interested in adopting one for a worthy cause? Mystic Seaport, in support of its many community sailing programs, is looking for generous individuals and/or clubs who would like to sponsor a Dyer Dhow. The Mystic Seaport Dyer Dhow fleet is always looking for improvements and maintenance in order to keep the dinghies operable for years to come. Monetary donations are helpful in keeping the fleet afloat. Funding is used for new sails and continued maintenance of the fleet such as new paint, new rails, new thwarts, or other needs. If you are interested in donating to the Dyer Dhow fund, please contact 860.572.5365. 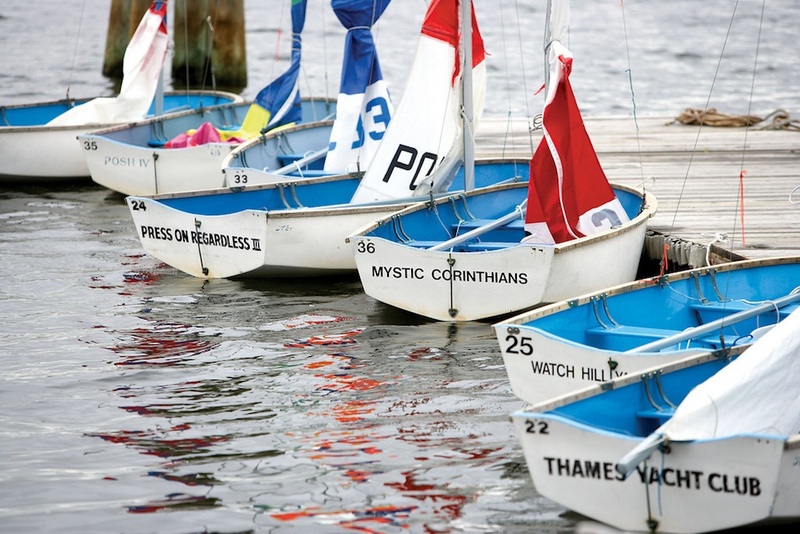 Mystic Seaport currently owns a small fleet of JY15s that are also used as part of the Community Sailing program. Donations of these vessels or in support of the fleet are also greatly appreciated. Located in Warren, Rhode Island, The Anchorage, Inc. has been building boats named after the company’s founder, Bill Dyer, since 1930. After creating the now classic 10-foot Dyer Dink, the most famous of the Dyer line of dinghies–the nine-foot Dyer Dhow–was built in the early 1940s manufactured out of plywood. In 1949, the first fiberglass sailing dinghy based on the version of the Dhow used during the war was built. While not the first boat ever built of fiberglass, the Dhow is the oldest continuously-built fiberglass boat in production today. The nine-foot Dhow was followed by the 7′ 11″ Midget and the 12 ½’ Daysailer. Dyer also makes the Glamour Girl, a launch or utility vessel, which can also be found at Mystic Seaport and as part of the Joseph Conrad Overnight Sailing Camp and Community Sailing programs. A versatile boat, the Dyer Dhow’s “hard chine” or flat bottom design offers great stability perfect for teaching sailing to all ages. Dyers Dhows can hold up to four people or approximately 650 pounds. Dhows are not just sailboats; many people use them as rowboats or powerboats as well. The Dyer Dhow Derby is an annual fall regatta held in honor of the yacht clubs, sailing associations, and individuals who have donated to or supported the Dyer Dhow fleet at Mystic Seaport. Registration is free. Come race a Dyer Dhow and show your support! 18. Eastern Connecticut Sailing Assoc.